In a small bowl, mix the 3 1/2 packets unflavored gelatin, or enough to set 7 cups of liquid according to the directions on the package, with the 1 cup cold water, and allow to set for 3 minutes. Stir the gelatin mixture into the pot, and add the half-and-half, mixing well. Strain the mixture and pour it into 1 large or several small molds and place in the refrigerator until thickened, about 4 to 5 hours. This dessert is good garnished with toasted, finely chopped almonds, ground cinnamon, and either Mexican-style Eggnog or Irish Cream Liquor. 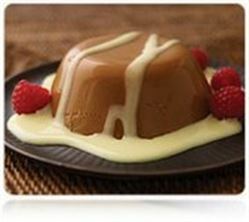 Enjoy this delicious cajeta gelatin Mexican dessert recipe!